LEO’s Haven will be the first inclusive playground to be built in Santa Cruz County. LEO is an acronym for Lauren, Evelyn, and Oliver Potts–three siblings whose greatest wish is to be able to play together at a playground. 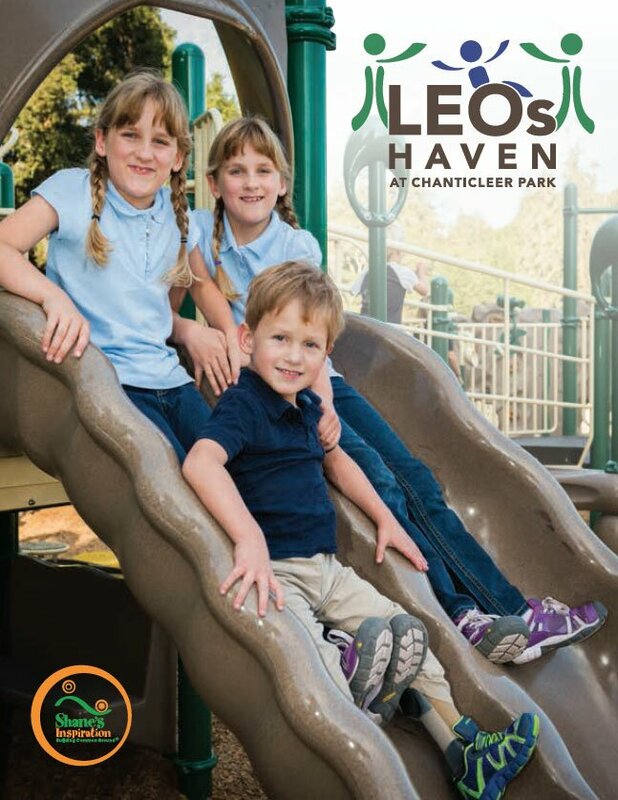 Haven describes the vision of the Live Oak community to provide children with a safe and accessible haven of play at Chanticleer Park. A playground is a child’s creative classroom. They learn by interacting physically, emotionally, and socially with their peers. While a child would never be denied entrance to school, children like Oliver, who uses a wheelchair, are routinely denied entrance onto playgrounds, as most traditional playgrounds are physically inaccessible to them. This means children with disabilities are denied access not only to their social circle, but also to the vital benefits of play. The inclusive design of LEO’s Haven, which goes beyond minimum ADA requirements, will be a unique place where children–regardless of their abilities–can play with their friends and families. Special-needs families will have an invaluable resource for connecting with other families navigating similar experiences. LEO’s Haven will also provide children with the opportunity to experience and accept their peers as equals–teaching lessons of compassion, awareness, and acceptance. A farmer’s market with whimsical chicken seats awaits in the 0-5 Play Area to provide interactive and imaginative face-to-face play. At the Animal Farm, elevated beams, rocks, and barrel steppers will hone lateral balancing and climbing skills while a shade canopy offers respite from the sun. Children can scoot up the stairs on the tractor, and go down the slides, or scoot through the tunnel to exit the front. Too Small To Fail panels engage children to interact with their friends and families to develop early learning literacy skills. If a child needs to “get away from all the activity” they can easily escape to the quiet Cozy Dome or hide under the vine tunnel. A scaled down Preschool Music Station provides smaller children the experience of sound play. The 5-12 Play Area offers fun and challenging inclusive activities for all children. A secondary entrance off Chanticleer Avenue beckons with tiled seats and a cooling overhead trellis giving children a little space before joining in the active play. The largest feature is the Chanticleer Farm Play structure designed with corrugated steel roofing and recycled plastic planks purposefully replicating a historic Live Oak farm. Fully accessible via ramps, the multi-level play structure offers many music and sensory activity panels for children to explore. Slides are accessible via wheelchair transfer stations. Resilient surfacing will cushion any unexpected falls. A gentle slope with rubberized pods will allow children to climb and explore. Rope pulls develop gross motor skills while balancing can be practiced on the boogie board or rickety climber. The High Activity Zone contains popular play equipment for children to rotate, swing, spin, and rock–all movement opportunities that promote physical activity, gross motor development skills, and provide vestibular and proprioceptive stimulation. The Oodle Swing, the Omnispinner, and the 4-Person Wee-Saw all provide opportunities for multiple participants to play together. The three-bay swing set is designed with two belt seats, two accessible molded high back seats, and two bucket seats for children of all abilities. Children in wheelchairs will enjoy maneuvering between activity zones along the Tike Track encircling the entire playground. Located around the playground are site amenities including accessible benches, trash receptacles, and shade trees. A custom 4′ high thematic fence will run along the playground’s perimeter for children’s safety. Sidewalks from Chanticleer Avenue and the main parking lot provide easy access to the playground. The off-street parking lot will have 33 parking spaces, including two accessible spaces. The entrance will be located off the intersection of Chanticleer Ave and Chanticleer Lane between the existing Miller House and the northern park property line. The parking area will have improved drainage and surfacing. The restrooms will include three individual accessible family restrooms and two accessible drinking fountains, and storage space for park maintenance equipment. See the LEO’s Haven Sponsorship Magazine for more details and sponsorship opportunities. If you have any questions about LEO’s Haven, are interested in scheduling a presentation for your organization, wish to have a physical copy of the LEO’s Haven Sponsorship Magazine, or would like to be a donor or a component sponsor, please contact Tricia Potts directly at 831-706-8760 during regular business hours or send an email using the form below. Images above shown for conceptual purposes as actual elements may vary.